We tasted this coffee together at the cupping table when we visited El Salvador in February this year and immediately fell in love with the clarity of the cup. It encompasses the beauty of Salvadorian coffees of the Bourbon varietal – sweetness and good balanced acidity, together with a lovely lingering texture in the mouth. We were fortunate to have the 6th generation (Federico Pacas and Lily Pacas) from Finca Santa Petrona to show us around the farm. The cherry pickers were busy separating the ripes and the unripes when we arrived. 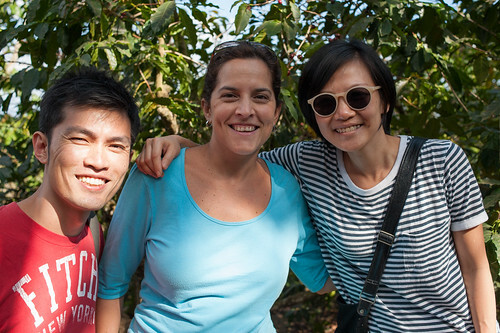 The Pacas family are dedicated to produce superior quality specialty grade coffees. To achieve this objective, the cherry pickers are educated about the importance of picking the ripe cherries. Some of the workers also got to try the brews made with roasted coffee from the farm. 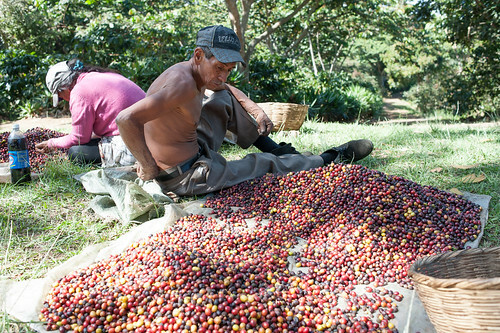 This is quite rare as most of the time, the workers in coffee farms do not get to try what they have harvested. Located around the Santa Ana volcano in the western part of El Salvador, this farm has an average altitude of 1450m above sea level. Growing primarily the Red Bourbon varietal (80%), there is also a small amount of Pacas (15%) and Pacamara (5%). Some history about Finca Santa Petrona: Back in 1917, Mama Tona bought 47 hectares of land on the slopes of the Ilamatepeque Volcano in the western part of El Salvador. Supported by her son, Santiago Diaz Palacios, they were determined to transform this property into a coffee farm. In 1950, Señora Petrona Diaz inherited the farm and together with Señor Alfredo Pacas Trujillo, who also came from a coffee family, started working in the farm with the same traditional practices and principles. More than 90 years and six generations of coffee growers later, the Pacas family continue to work the land of Finca Santa Petrona. It has been recognised as one of the farms in Santa Ana that produces excellent coffees. The success of the farm is a result of its core values: respect to the workers and to the local communities as well as maintaining good harmony with the environment. The coffee from Santa Petrona is processed at Beneficio Tuxpal, which is managed by Federico Pacas, incidentally the brother of Lily Pacas. 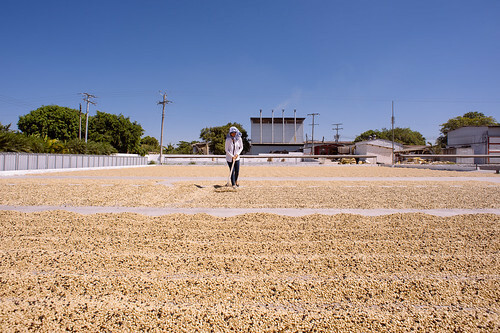 While most of the coffees are fully washed processed, there has been increasing demand for honey processed or dry processed coffee from international buyers. Beneficio Tuxpal is well-organised, clean and professionally managed. Though this wet/dry mill is already quite impressive, Federico is looking to try more experiments on shade-drying and upgrade its facilities with a shelter for the fermentation tanks. As specialty coffee roasters, this relentless pursuit for better tasting coffees is something we have in common and something we truly appreciate of producers like the Pacas family. We have been waiting to roll out this coffee for our brew coffee selection since we received it a couple of months back. This coffee is lovely as a brew. In the cup, expect raisins, peaches and apricots. We feel the soft stone fruit acidity and honey sweetness is the highlight of this coffee. The silky mouthfeel and butterscotch finish rounds up the cup to end off with an immaculately clean cup.